With clarity, humor, and insight, award-winning filmmaker Barnet Bain guides readers to unlock the raw power of the creative self. 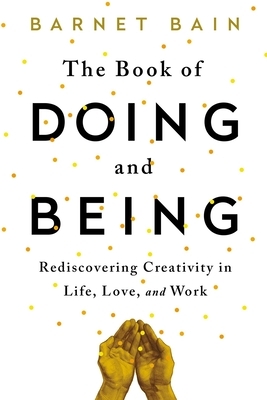 Sharing creativity principles and practices at the leading edge, The Book of Doing and Being offers a life-altering map for stepping beyond what we already know and into a dimension of imagination from which innovation is born. Known for his inspiring movies and documentaries, as well as his popular creativity workshops, Barnet Bain makes available his teachings for the first time in book form. Discover how will and action come together with imagination and feeling to form the very foundation of creativity by working with this treasury of more than forty transformative exercises. Each one is designed to spark new creative connections by challenging our usual ways of thinking, feeling, and perceiving. These lessons, tools, and techniques serve to unlock great reservoirs of creativity in every individual, whether it’s jumpstarting or completing a project, launching a new business, creating a work of art, experiencing more fulfilling relationships, or making other dreams come true. Bain’s motivational guidance includes: rewiring your brain to unleash ultra-creativity; finding freedom from self-criticism, perfectionism, and other obstructions to productivity and creative expression; harnessing the two forces of creativity: inspiration and action; discovering your emotions as the doorway to creative aliveness and ingenuity; and heeding the call of your Real Work, regardless of age, education, or experience. Step by step, you will make the discovery of a lifetime: how to stop being ruled by your past and start consciously creating your present and future. You will be surprised and energized—by your next creative impulse, the next idea that excites you, the next experience that moves you—and you will live a creative life. Barnet Bain is an award-winning Hollywood producer and director, radio broadcaster, and creativity expert. Select film credits include Oscar Award–winner What Dreams May Come (producer); Emmy Award–nominee for Best Picture, Homeless to Harvard (executive producer); The Celestine Prophecy (writer, producer); The Jesus Film (writer); and The Lost and Found Family (director). Barnet is a member of the Transformational Leadership Council and a founding member of the affiliated Association of Transformational Leaders. He is also a contributing blogger for Huffington Post. Barnet consults and trains business leaders and private clients who are committed to high performance. Through his workshops, telecourses, and training seminars, Barnet guides people of all ages and walks of life to expand their vision of what is possible, step into their purpose, and contribute their gifts and talents with passion. “Bain authentically demonstrates that “BEING” with the right attitude puts your aptitude on steroids, so that you’ll be active in “DOING” for your success. "With brilliant clarity, delightful humor and deep insight, Barnet Bain reveals in The Book of Doing and Being how everyone can unlock their inner potential for creativity and make their dreams come true. I highly recommend it." "A delightful powerhouse of a book that promises to unleash a tidal wave of creativity. Barnet has managed to capture the core of creative brilliance and generously shares it in ways that are sure to inspire and ignite your own." "In this ode to the power of being, creativity, flow and essence, Barnet Bain teaches us how to access our forgotten self so that we may live to our highest potential. Insightful, practical and deeply compelling!" "The Book of Doing and Being can be the catalyst to your next greatest creations, projects, and life's journeys. Barnet has found the most eloquent and experiential way of awaking in us and drawing from our souls the very energy required to luminate and electrify this planet with an unparalleled creative force." "Bain masterfully leads us to activate our creativity, innovation, passion and purpose. Be bold. Explore this book and expand your imagination." "Barnet Bain’s book gracefully conveys the thrill and discipline of the creative process. It will stretch you in unexpected ways that can unlock your creative heart." "A glorious guide into our own possibility, into and past our blocks, to our true liberated being. Creativity is not merely an endowment for the fortunate few, it is a universal opportunity that grows in our relationship to self. Barnet Bain, a highly creative and innovative artist, helps us to unleash our gifts, talents, and vision. Bain starts with the premise that we each have a passion, a unique calling, and, if found, it helps us to live far more fully. Bain then gives us reason to believe in ourselves, and with some helpful steps, to realize our true nature, our calling!" "If you haven't yet experienced the delight of attending one of Barnet Bain's workshops, this book will introduce you to a singular creative force: YOU. Experience your self as a spontaneous wellspring of fresh ideas, and put them into immediate action. Barnet will ignite your creative fire." 'If you think you are creative, you are. Even if you don’t think you are creative, you still are. Either way reading this book is an illuminating journey of discovery that offers to usher you into a state of aliveness through your full self-expression in day-to-day life." "In The Book of Doing and Being, Barnet Bain affirms that creativity and real work are for the inner life what exercise is for the body. There’s no getting around it, and immersing ourselves in it brings us alive. This book offers aerobics for the heart."